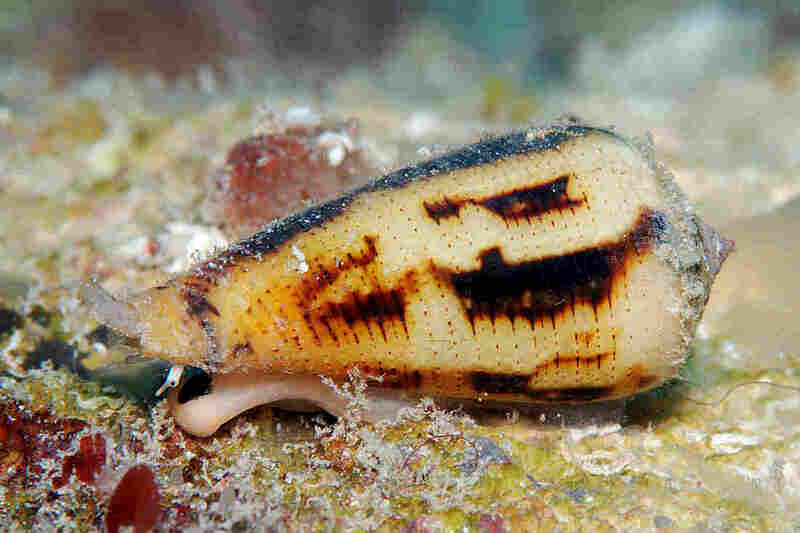 Your Next Painkiller Could Come From A Snail : Shots - Health News The drug derived from the venom of cone snails must be injected into the spinal column to get beyond a patient's blood-brain barrier and bring relief. But scientists think they may have a workaround. The sea snail Conus magus looks harmless enough, but it packs a venomous punch that lets it paralyze and eat fish. A peptide modeled on the venom is a powerful painkiller, though sneaking it past the blood-brain barrier has proved hard. Researchers are increasingly turning to nature for inspiration for new drugs. One example is Prialt. It's an incredibly powerful painkiller that people sometimes use when morphine no longer works. Prialt is based on a component in the venom of a marine snail. Prialt hasn't become a widely used drug because it's hard to administer. Mandë Holford is hoping to change that. She and colleagues explain how in their study published online Monday in the journal Scientific Reports. Holford is an associate professor of chemical biology at Hunter College in New York and on the scientific staff of the American Museum of Natural History. As is so often the case in science, her path to working on Prialt wasn't exactly a direct one. She's a chemist, and her first passion was peptides — short strings of amino acids that do things inside cells. "I started out with this love for peptides," Holford says, then laughs. "Love! Sounds weird to say you love peptides out loud." When Holford was in graduate school, a visiting scientist named Toto Olivera gave a lecture about the peptides in snail venom. "He has this amazing video of a snail eating a fish," she says, "and it just looked so crazy." National Geographic has a similar video posted on YouTube. Holford was captivated. How could a snail eat a fish? The secret, she learned, was a powerful venom the snail uses to paralyze the fish. Now, it turns out this venom is made of a hundred or more different peptides, most of them harmful to people. "If I were to inject you with the complete cocktail of cone snail venom, it would kill you," says Holford. But one particular peptide in the venom is able to do something medically useful: It dramatically reduces pain. In 2004, the FDA approved the drug Prialt, made from a synthetic form of this particular peptide. Right now, Prialt is only used in cases of extreme, unrelenting pain because there's a major problem with the drug. "It doesn't cross the blood-brain barrier," Holford explains. The blood-brain barrier is a kind of membrane that prevents most compounds in the blood from entering the brain. In many ways, that layer of protection is helpful, but if Prialt doesn't get into the brain, it can't ease pain. So, at this point, the drug can only be administered via an injection directly into the spinal column — which isn't very convenient for patient or doctor. Holford has been looking for an easier way in. "We're using what I call our 'Trojan horse strategy,' in which we put the peptide inside of a carrier — which is called, in this case, a viral nanocontainer," she says. It's a tiny receptacle made from proteins found in viruses. "Then," Holford explains, "we sort of shuttle it across the blood-brain barrier, using another peptide, which is a cell-penetrating peptide, which can cut through all sorts of membranes — including the blood-brain barrier." As Holford and her Hunter College colleague Prachi Anand note in their journal report, the system seems to work in a laboratory model of the brain barrier. If her idea stands up to further testing, it would be possible to inject the drug intravenously — or maybe someday just take it as a pill. But there's still a lot to do before Holford and her colleagues will know if that's really possible. "The next step is to figure out if the peptide is still functional once we get it across the blood-brain barrier," says Holford. In other words, whether it still works as a painkiller once it's delivered with Holford's Trojan horse. I'll report back when they've figured that out. This story is part of Joe Palca's series Joe's Big Idea, an exploration of how ideas become innovations and inventions.